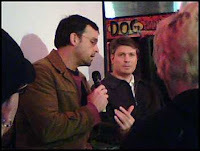 I just had the pleasure of reviewing and attending a launch event for the DVD, The King of Kong: A Fistful of Quarters. It is a humorous documentary on the 80s arcade game relic—Donkey Kong—and those who have spent their lives trying to master it. Back in 1982, gamer Billy Mitchell scored a high score of over 874,300 in Donkey Kong and for twenty years no one had even come close to beating him, elevating Mitchell to a cult star. He was later named the “Gamer of the Century,” but as the film shows, he’s not the most humble of divas. Luckily, there’s a new gamer in the O.K. Arcade, Steve Weibe, a genuinely likeable school teacher with Donkey Kong in his garage and a dream in his heart to be the best at something. But as the film’s tagline reads, “In the cutthroat world of Donkey Kong, only one man can rule” and soon a cross-country, old school arcade duel for the right to be included in the 2007 Guinness World Records book ensues. Several tears, treacheries and tirades later... it’s on like Donkey Kong (full review). The launch event appropriately took place at an arcade and similar looking gaming enthusiasts--geeks--were there, I guess I'd be included in that though. The games were free and I beat several guys at a basketball shootout game and had fun playing Family Guy pinball, but the most anticipated part of the party was the Q&A with the protagonist Steve Weibe and the film's producer Ed Cunningham. I learned that they shot about 400 hours of raw footage to make the 90 minute film and that they are now turning the story into a feature film from New Line with actors and a script. Ed mentioned his ideal actor to play Steve would be Greg Kinnear and I so could see that. Steve also played Donkey Kong of course and shared some tips of the trade. Note to self: Don't buy future hubbie a Donkey Kong arcade game. I definitely wanted to see this movie, I heard about it awhile ago. It's crazy that someone could be so good at Donkey Kong...crazy I say. It's on like Donkey Kong is my favorite saying. ever. Please let me know if there is anything I can do, and again, thanks for covering "Kong." Ps-the "don't buy future hubbie a Donkey Kong" made me laugh...I'm sure Nicole Wiebe, Steve's wife, would agree with that sentiment.